You decide our fee. Period. Circle CPA is proud to offer our brand ambassadors 25% commission on each and every client they send our way. When our service regularly costs $100-$300, this quickly adds up to some serious bucks! Circle CPA is a tax startup committed to changing the way taxes are done in America. Our goal is to make a CPA accessible and affordable to everyone by offering CPA-prepared tax returns at a price set by our clients. We are planning to completely disrupt the current tax prep industry. Circle CPA invites you to join us on our mission to improve the financial lives of all Americans through making CPAs accessible and affordable in a way previously impossible. As a valued brand partner, you will receive a 25% commission for completed 2018 tax returns on all client referrals that come from you. Currently, the average price an American pays for a CPA to complete their taxes is $273. 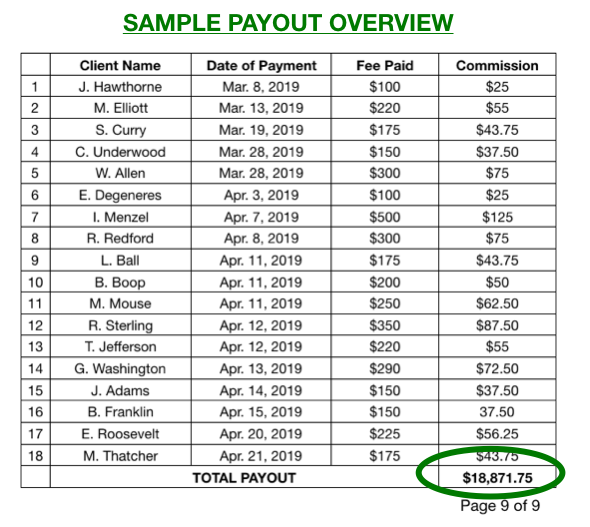 At this rate, you would receive nearly $70 for each client referral, or $10,000 for every 150 referrals, without limit. We want this to be a mutually beneficial partnership. In addition to the financial payout, we will do all we can to promote your brand through our social media channels in an authentic & engaging way. At the end of each tax deadline (specifically, no later than May 15 and Nov. 15), we will tally up your campaign results and transparently share them with you in a detailed commission report. In this partnership, you maintain full creative control over the type of content and how often you post. That said, we are completely available to provide ideas, give you ready-made content, and offer support in any way possible. If you are interested in becoming a brand ambassador for Circle CPA’s, please send an email to Catherine at catherine@circlecpa.com with the subject line: BRAND AMBASSADOR.